By Gary WA2JQZ, with Rob KB5EZ. 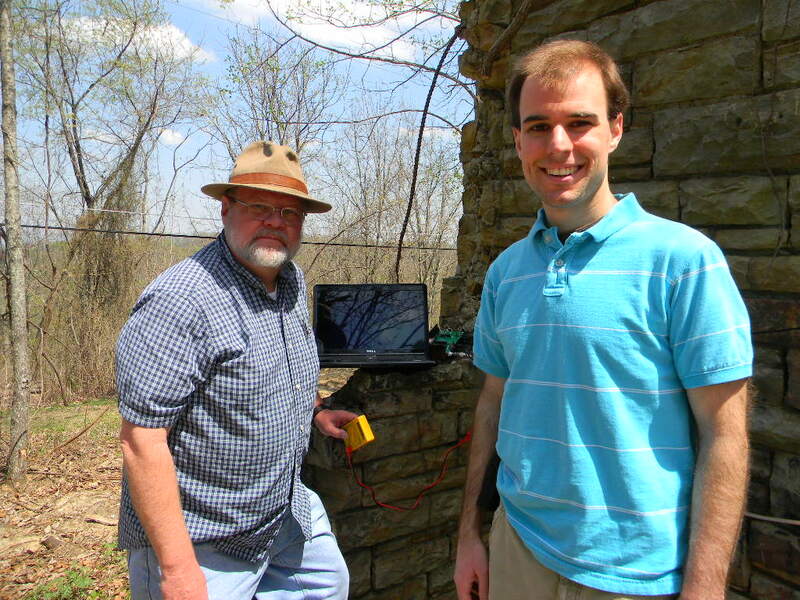 On a nice Saturday last April, Rob KB5EZ, Kalen KK4KLT, and I WA2JQZ met at Monte Sano State Park to operate a portable, digital QRP ham radio station. We set up and operated a portable JT-65 station for the international “Summits on the Air (SOTA)” [http://www.sota.org.uk/]. 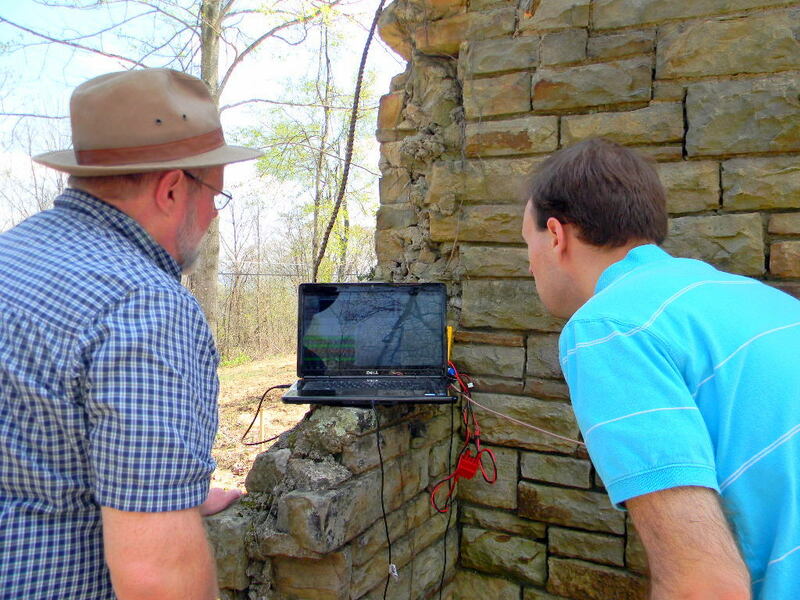 This was the first time a JT-65 operation was tried on Monte Sano — such a first-time activity is called a summit “activation”. For some this is serious physical sport. As for us, we parked near the ranger office, and hiked a few hundred yards to a clearing on the ridge, which fulfilled the SOTA rules. 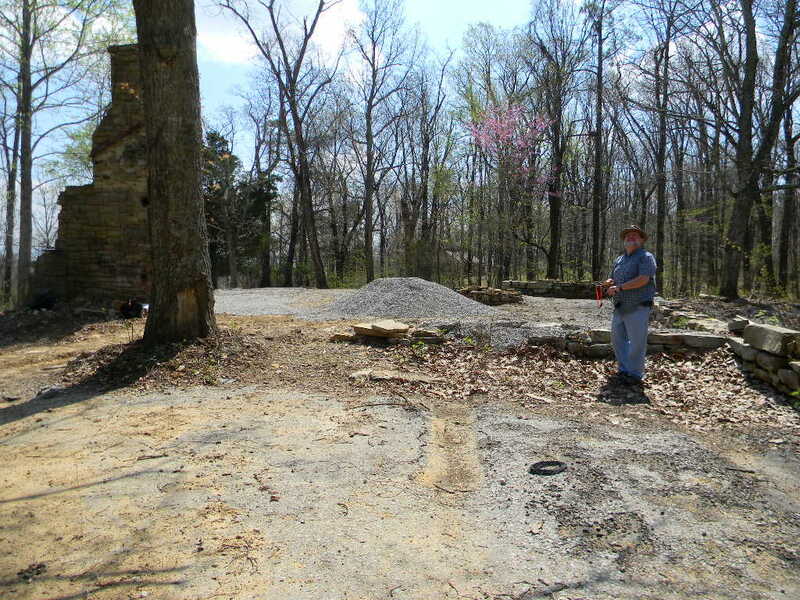 Monte Sano is on a relatively long and flat sandstone capped plateau ridge, about 2000 feet in elevation. 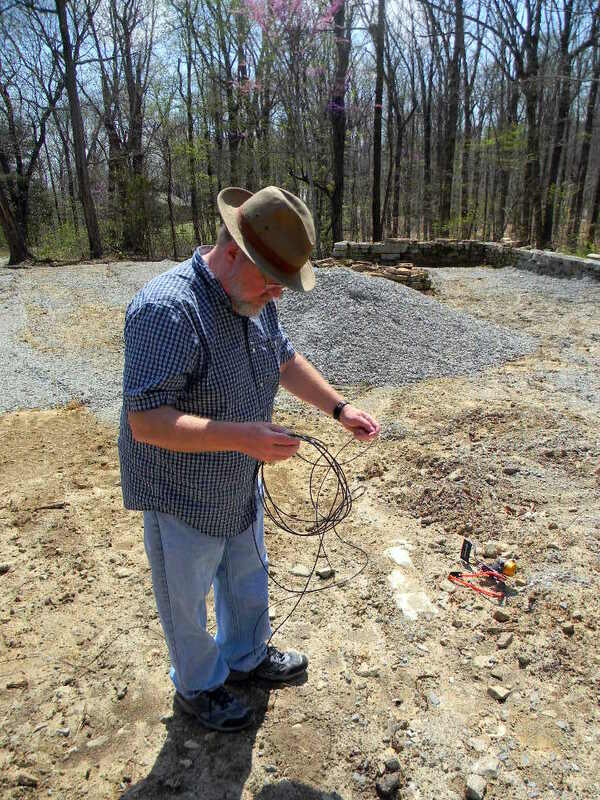 We chose a location near the east edge of the plateau, that was clear and had once apparently been the site of a cabin. 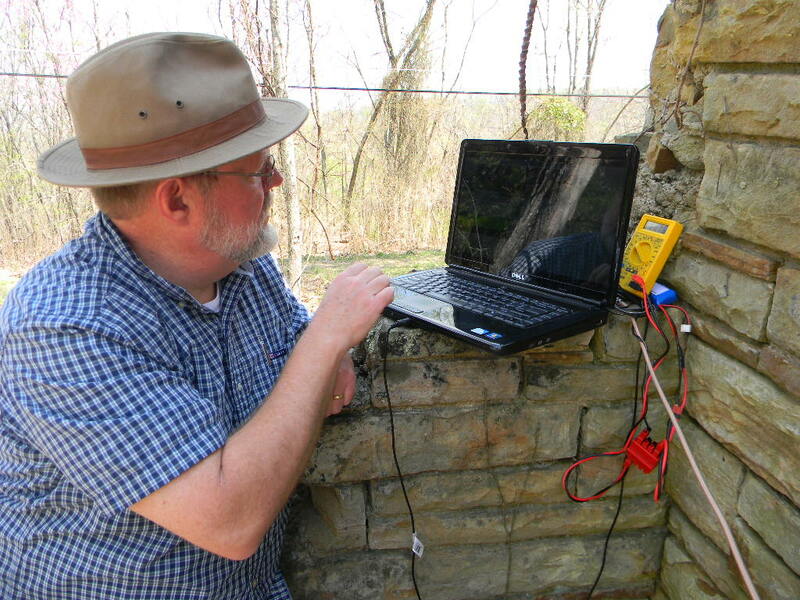 Rob operated JT-65 with his TenTec Rebel and laptop, with some portable batteries. But first we had to erect his EndFedz end-fed 20 meter wire antenna. 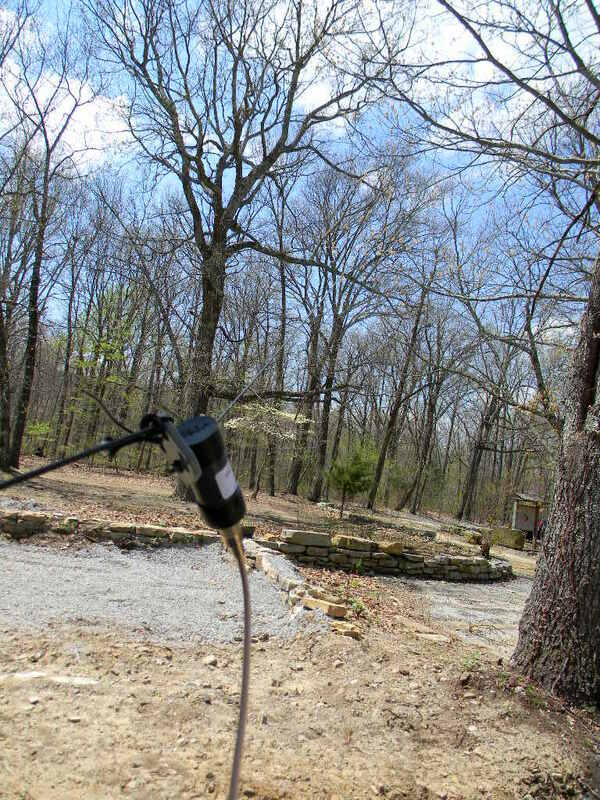 Using a homebrew slingshot, Rob shot a fishing line over tree branches to raise the antenna. After the end of the fishing line swung over a tree limb and returned to the ground, we attached the antenna’s support cable to the fishing line. Here Rob is reeling back the fishing line, to raise the antenna support cable. Rob reeling back in the fishing line, to raise the support cable for his EndFedz 20 meter antenna. Rob preparing the antenna support cable. Monte Sano. The 20 meter endfedz antenna with balun, deployed, supported by a tension line at this side with the coax feed. The antenna is strung over the tree branches and tied at the other end with another support cable. Monte Sano. 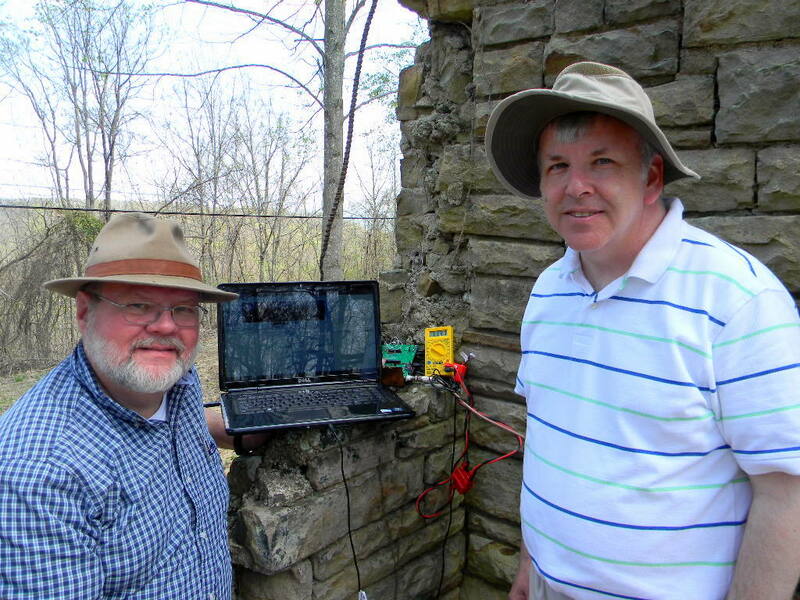 Rob KB5EZ set up his laptop to run the digital mode JT-65. A small blue battery and his TenTec QRP Rebel transceiver are behind the monitor. The yellow volt meter was added to monitor the drain on the battery. We needed shade in order to view the monitor screen. We needed shade in order to view the monitor screen. 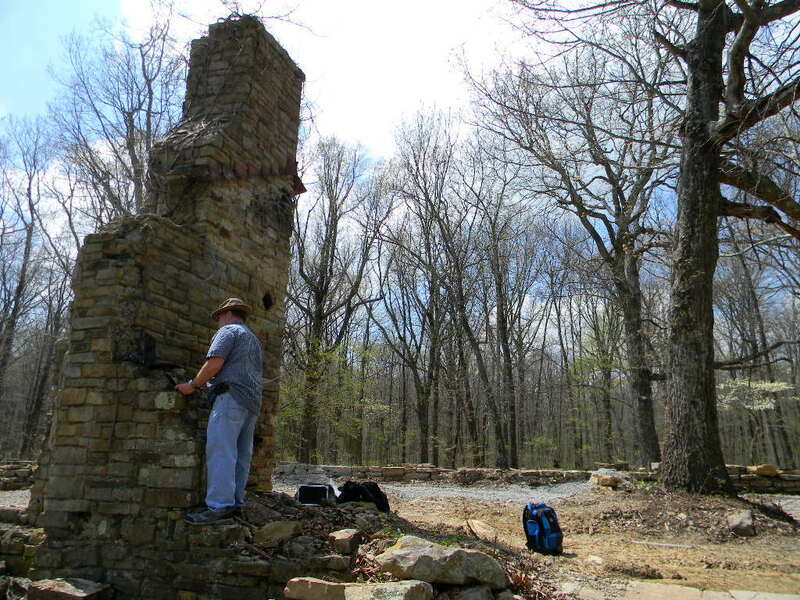 We therefore chose to set up at this old chimney. 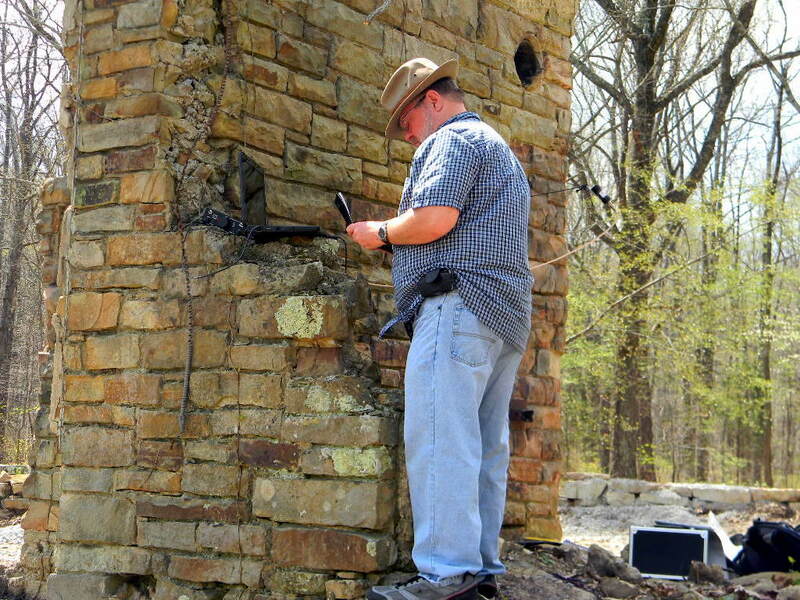 The chimney also served to support one end of the wire antenna. 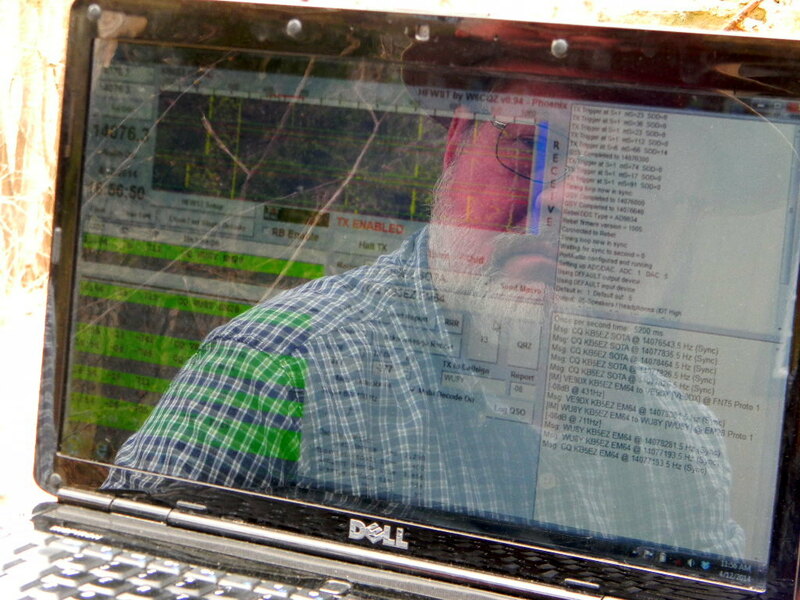 Although Rob’s program logs the QSOs, Rob also used a notebook as a backup logbook. 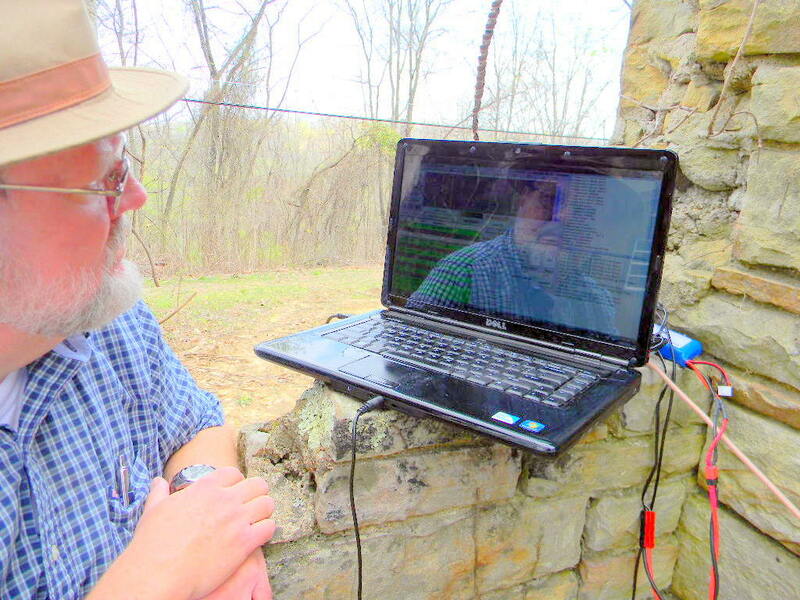 The TenTec Rebel QRP transceiver is visible behind the laptop. The program window displays the information we need to have a QSO and monitor other QSOs happening at the same time. The dark colored portion at top left is a “waterfall” display that shows the signals we are receiving (frequency is the horizontal axis) within a 2 KHz-wide range, centered around our set frequency. For 20 meters JT-65, that set frequency is 14.076 MHz. Time is the vertical axis, and the display scrolls downward with time. Therefore each roughly vertical line is the display record of someone’s live JT-65 signal. We can choose to respond to a signal calling CQ, or find a clear frequency and send out our own signal. Or sometimes, if the situation seems worth the attempt, we could try to call a station that is just finishing a QSO with someone else. Transmissions are cycled exactly for one minute each, referenced to Greenwich Mean Time. For a QSO, one person sends while the other receives, then the roles switch. The data transmission lasts 47 seconds, and contains a maximum of only 13 characters. During those 47 seconds the message is sent twice, and error checked. The last remaining 13 seconds of the minute are just enough time to read the latest text messages and choose a reply. JT-65 was originally created for EME Moon bounce. Its ability to reliably send short messages as very weak signals makes it a popular amateur mode. If you look closely, you can see that each JT-65 signal is composed of a base frequency with discreet jumps a few Hz higher, creating the characters. The lower left part of the window lists each message transmitted (with a time stamp). If the line is illuminated in green, that message is a CQ call. If the line is illuminated in red, your callsign is in that message! How do you have a QSO? The lower-middle display lets us choose what message text to send. The standard message exchanges are preset and can be activated with mouse clicks. There is also a field for a 13 character free-text message, which must be typed in. We could call CQ. We first much select a clear part of the spectrum by clicking in the waterfall at the base frequency we want to operate. The red bar at the top of the waterfall indicates the frequency range our transmission will use. In the lower-middle display we then select the “radio-button” to send a CQ message, we choose whether to send during the odd or even minute part of the cycle, and enable transmit. The CQ message will automatically include our callsign with our grid square, e.g.,: “CQ KB5EZ EM64”. We could alternatively call CQ with a text message of our own. Rob sometimes tried “CQ KB5EZ SOTA”. Or we could try to respond to someone else’s CQ. That’s done by double-clicking the text line at left that we want to respond to. The program automatically selects the caller’s frequency, then sends a preset text with our callsign and our grid square, for example, “VE9OK KB5EZ EM64”. The person sending the CQ can acknowledge the response by calling the station back with a signal report (by double-clicking the text line and selecting the “radio-button” for signal report). The message could look like “VE9OK KB5EZ -04”. Then the second person sends a signal report in response. The signal report value is the decibels below the noise floor, and is automatically determined by the program. Afterwards, “RRR” and “73”, or some closing message is sent. And that’s the QSO. If several people respond to a CQ, the caller has the option of which one to respond to. If no one responds, one could continue to call CQ. The programs usually have a counter to call 5 CQs automatically, and then if there is no further action, to stop. Our challenge is that we operate at very low power. Most other stations operate with more. A station that we hear very weakly will probably hear us even more weakly or might not hear us at all. If they do notice us, they might easily choose to respond to a stronger signal. We’re competing with stronger signals. And so a rule of thumb, for better success operating at low power, is to call CQ to seek others to contact us, rather than compete with responding to other stations. In other words, if we call CQ, we have the chance to get several callers at once. If we respond to someone else’s CQ, the odds are strongly reversed against us. However, if we still do respond to another CQ, then it is best to respond to the stronger signals. Chances are better those stations will hear us as a strong signal too, and therefore would more likely respond to us. Rob KB5EZ and Kalen KK4KLT. During the afternoon we had 3 QSOs in reply to our CQs. We also succeeded in replying to 3 other stations that called CQ. We had a total of 6 QSOs. JT-65 is a slow-paced mode in which to make contacts. With the challenges of operating QRP in the field, this is even more so. Nonetheless, as Rob pointed out at his presentation at the 2014 Huntsville Hamfest, you then have time for other things. You can really enjoy your outdoor environment. You can talk with your friends. And you can easily attract non-ham visitors who pass by. You have lots of time to show and tell with them, to have a relaxed chat and to share the enjoyment. As you can see, we had an enjoyable outing!